That thick, smoky barbecue smell floats through the yard and everybody starts salivating for dinner. Moonlight burgers for one will have to suffice. I don’t know who you are, but we need to open an all-night restaurant named Moonlight Burgers. I’m a total night owl and I love to cook. Sign me up, please? Sounds like fun. I wish I had a barbecue. Top all of this off with a cold case of beer or some fresh margaritas and then your good to go! I love this time of year. Thanks for the tribute, Rob. Ha! That actually made me laugh involuntarily. I like that you’d totally just bark this over the cubicle wall. Offices are really missing that sweet, smoky barbecue smell, aren’t they? Barbecuing is the most fun kind of cooking, I think. He ruins a wonderfully simple thing. oh.my.god. i nearly died laughing. hilarious. and awesome! BTW: AT is the sister of Freddo, who has recently become obsessed with this site. Her husband is always “really, really selling it” at family BBQs. You should try cooking the meat using the old fashioned coal, wood, some paper and a couple of matches to light the fire. Better taste and you’ll look as the master of barbecues. I think you can only do one thing well..either the food or the sales. But if you wanna try both the best of luck to ya! Now that’s it has started to warm up, all our neighbours are bbqing, and it is practically a form of torture! 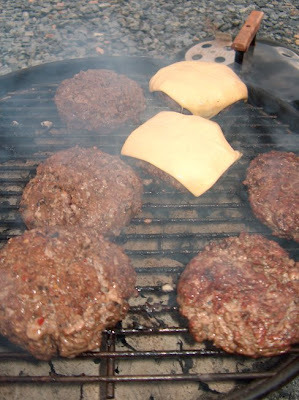 Pffft, REAL bbq’s don’t have lids on them! Slice a 44 gallon drum in half, fill it with wood and away you go! Using Jack Daniel’s charcoal and telling all the guests that the coals won’t light unless he has a bourbon – my dad. Makes me laugh. Just did some of this last night. Haha!